- although a 4 wheel drive vehicle is not necessary, a vehicle with high ground clearance is essential - this is a wilderness-style experience & self reliance will be necessary, ie. No toilet paper, soap or shampoo etc is provided, & there are no shops nearby. We do provide these items (click here for the inventories of amenities & equipment we supply) to make your stay comfortable, but nothing other than these items is provided. Careful planning and provisioning is absolutely essential. - NO pets are allowed regardless of size/type. This is a sensitive/protected wildlife area. Failure of the customer to arrive, or cancellations made 0 to 30 days prior to the agreed arrival date forfeit 100% of the chalet cost. The “guarantee” of 30% will be refunded. Cancellations made 31 to 60 days prior to the agreed arrival date forfeit 75%. On receipt of a written instruction to cancel the reservation, including bank details, Cedar Rock will refund the applicable amount. Cedar Rock levies a 5% administration fee on any refunds processed. No dogs or pets permitted. For reservations requiring fresh linen during their stay the responsibility for return and collection remains the guest’s. New linen is also a new cost. Key sets and linen are to be returned to Mount Cedar by the guest, for guarantee credit, on departure. Smoking in the chalets is strictly forbidden. Maximum speed on all roads not to exceed 30kph. Guests must vacate the chalet by 12pm. The chalets will be available from 2pm to new guests arriving. The guest uses and occupies the accommodation at his/her own risk, and the lessor cannot be held liable for any damages of whatsoever nature and howsoever arising by virtue of the guest’s occupation of and/or activities on the accommodation and/or the property, irrespective of any negligence on the part of the lessor. Eagle Chalet is the second of the two more isolated chalets which make up Cederberg Chalets accommodation in the Cederberg. As with the others, Eagle Chalet is a fully restored version of the traditional shepherds’ stone cottages and provides two bedrooms which can each accommodate two guests. Everything the intrepid explorer may need is provided within this comfortable chalet, though guests will find no excessive luxuries present as they detract from the untamed character of Cedar Rock. Complete with a magnificent stone fireplace, gas powered fridge, stove and geyser – explorers of the Cederberg are ensured of comfortable lodgings to return to after an exciting day of hiking, fishing or game viewing. 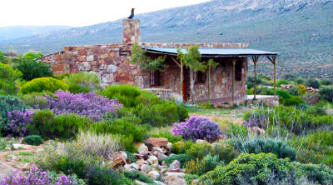 Eagle Chalet is designed to accommodate a smaller group which intends to take full advantage of the feeling of tranquil isolation inherent to the Cederberg. Although the reserve’s administration office and the other lodges are only a few kilometres away – they are certainly not visible from your porch. Eagle Chalet gives direct access to beautiful mountain climbs. Having a mountain at one’s immediate front door is not a claim that many people on earth can make but, for the duration of your stay, this is exactly the case. The apex of your mountain retreat gives breathtaking views of the Doring River canyon, which stretches out below, and an unobstructed view leading up to the distant Karoo mountains. As with the other chalets on the Cedar Rock reserve, Eagle provides an air of absolute tranquillity and silence. This is a journey which is all about you and nature, allowing for no distractions as you hike the hills and mountains or take to the trails on foot or with your bicycle. 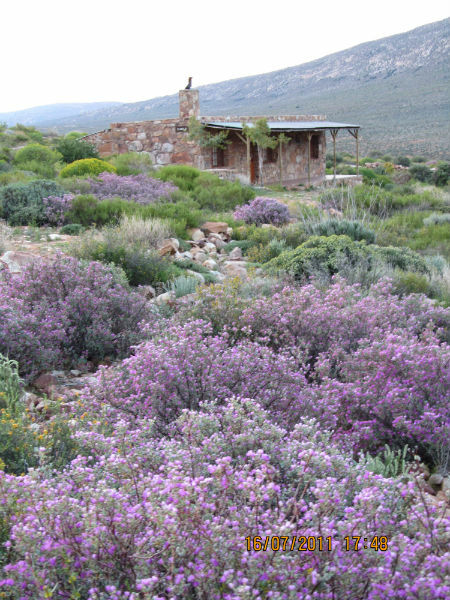 Complete with unmatched floral displays in season as well as roaming zebra, gemsbok and more – Cederberg Chalets provides you with a once in a lifetime experience which is unreplicated elsewhere in the world. To secure your accommodation in the Cederberg, continue through to our reservations section and make the journey which will redefine you. ** Please note: should a same day booking be made over a weekend, ie Saturday / Sunday, etc, the fridge will not be switched on in advance of your visit. PLEASE NOTE THAT THE CEDERBERG HAS NO CELL PHONE COVERAGE.